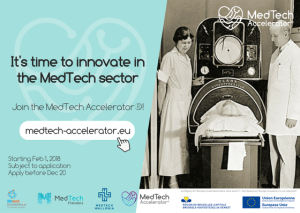 The 2018 edition of the MedTech Accelerator® has been developed together with MedTech Flanders and MedTech Wallonia. This 4-month program builds on regional strengths to offer you a hands-on program addressing key business tools and medtech specifics to skyrocket your project. You will also benefit from regional mentorship, regular peer-to-peer feedbacks, testimonials, visits and many opportunities to showcase your solution in Belgium and beyond. Have a look at the program here and apply now! Program starts on Feb 1, 2018.